Have you ever been fortunate enough to sell to a group of people that just get it? You don’t have to do a lot of convincing, you simply present what you have and your audience TOTALLY understands the value because they believe the same things you believe? That was my experience last week in New England as we launched Spink and Edgar at Jordan’s Furniture. Lorie Silva is the Director of Bedding Operations which doesn’t even come close to explaining what she does or what she means to that business. Lorie is a very talented merchant but is also intimately involved in operations, logistics, training, product development, store display, consumer experience, accessories, and about a million other things. She has an incredible ability to identify the next big thing and understands how to make it work in her carefully sculpted business. Her sales force is easily one of the best in the industry, and like Lorie, they live and breathe the mattress business. They also love their jobs and the company that they work for. How big is that? If you have never had that experience or your people don’t feel that way about you or your company, you really don’t get what’s important. Lorie would NOT be enjoying the success she does every year if it weren’t for one of her top people Keith Levine and she would be the first to tell you that. Keith also works operations and is a whiz when it comes to training. Lorie doesn’t just count on Keith however, it seemed like everyone she introduced me to from the Sleep Lab Managers to the sales force were, according to her, CRITICALLY IMPORTANT and after meeting them I believe it. Together, they have built one of the most successful mattress businesses I have ever seen. Simon Sinek says not to hire people that will work for your money, you need to surround yourself with people that believe what you believe. If you do that, they will give you their blood sweat and tears and this group certainly does. 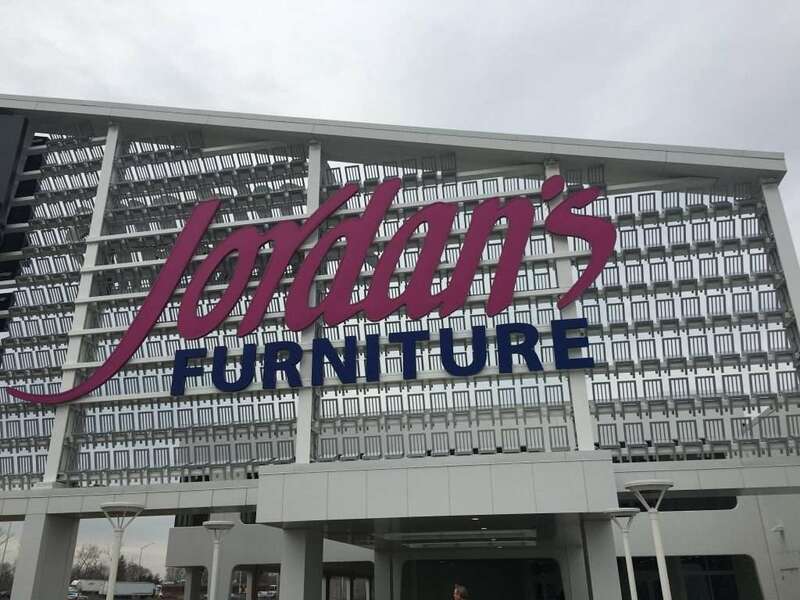 Jordan’s sign in New Haven. Made up of over 300 chairs. Can you see them? I flew out on a Saturday and spent the next 6 days traveling stores with Lorie and Keith, learning their business, and hopefully sharing some of my passion for this industry and the Spink and Edgar program with their team. The whole thing was actually pretty humbling for me and I am grateful to every one of them for expressing their enthusiasm for what we are doing. They validated so much of what I think, and I felt like I was with friends the entire trip. It never fails…when I am asked to come in and speak to a group of people to get them fired up, I am always the one that benefits the most. 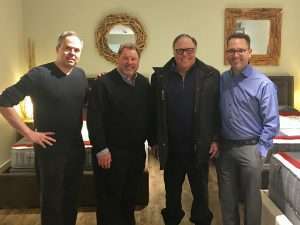 The man I call the “Godfather” of the mattress industry, Leon Ellman, attended one of our meetings along with Neil his son and Mark Chase, all from Sherwood. Really glad they could come and see for themselves how perfect this relationship really is. My brother Jeff and I are very fortunate to have those guys as business partners. Then on the final day to top if all off, Peter Bolton the COO for Jordan’s, made it to our meeting. We had some great conversations, he showed me around the store, and we talked about family. I told Peter that I was bringing my 12-year-old son with me to Jordan’s so he could see what Dad does for a living and experience these stores first hand. Peter really lit up when I told him this and made me swear to let him know when I was coming so he could be a part of that and make it special for Nick. I know that Peter is very busy running this empire, so the fact that he not only offered that but did so in such an authentic way says all you need to know about this guy. He believes what I believe. Neil Ellman, Mark Chase, Leon Ellman, and me. Only days after returning home I received an email from Lorie with results from our first week on Jordan’s floor and I was blown away. For me, knowing that we have Sit’N Sleep (another INCREDIBLE company), as our West Coast anchor and now Jordan’s on the East Coast we are exactly where we want to be. From day one, we never intended to sell Spink and Edgar to everyone. We wanted to sell our products to people that understand there is more to this industry than product/price/ and promotion. Companies that understand building value in the emotional benefits of great sleep and the mattresses ability to deliver that. Most of all, we wanted partners that love the fact that we grow our mattresses on a small farm in the countryside of Yorkshire, England. We wanted retailers that give us credit for delivering a product to the industry that not only justifies our best selling price point at $5,000 in queen, but gives them a line that DELIVERS on the incredible story with equally incredible feels. We wanted to do business with people that believe what we believe…and we are. To all of my new friends in the Jordan’s family, I say thank you for a very meaningful experience. For those of you reading this that think I am blowing a lot of smoke in this blog post to a very large new customer, I would say that you don’t know me and you have never met these people. Do you surround yourself with people that believe what you believe? If not, why not? ⟵Go Ahead. Be A Hero. Thanks for another great article Mark! Simon’s book “Start With Why” led me on this journey. After my second listening to his book I realized that I wasn’t with people who shared my Why and Now I am with a group who shares my Why! I need to make a trip to Jordan’s to see it for myself. Thanks for sharing Mark! I completely agree with you and your philosophy. It’s all about presenting a great product that you are passionate about, developing strategic relationships and the right fit. The retailer needs to believe in what he is offering to the consumer.